"I was totally scared s***less when I saw he (Brent Vaughn) ran 13:18 at Stanford"
Dayron Robles: "Every world record is perfect." The 21-yr old reflects on his world record and is excited about competing in his 1st Olympics. *Ohuruogu Admits Olympics Will Be Tougher To Win That World Champs With Sanya Richards likely to compete, the Brit thnks it will take a 48 second 400 to win. *Gete Wami To Arrive In Britain Less Than 24 Hrs Before Attempting to Defend Her BUPA Great Women's Run Title Visa problems are too blame. The race is Sunday and Liz Yelling is also in the field. 12.87 WR for Dayron Robles, Usain Bolt 19.83 Dire Tune 1 Hour Record Liu Xiang may have the pressure of 1 billion people on his shoulders at the Olympics, but he no longer will be the favorite as Robles has the World Record. Kaki over Rudisha at 800, Kipchoge wins 5k, Dibaba wins 10k. LRC: The Week That Was What a week it was as Bislett and Prefontaine were simply amazing. We recap all the action across the globe and help put it all in perspective. The action was so amzaing it seems almost unbelievable - from a woman running 14:11, to a teenager running 1:42, to a Brit winning the Dream Mile, to the world champ in the men's 800 being totally ignored on the US tv broadcast. Plus we give everyone a history lesson about the incredible 1982 Dream Mile, where the American, Irish, and New Zealand national records were all set (and all stood for 25 years, video of the mile as well). US Stud: German Fernandez Coach Knows What He's Talking About And He Says Fernandez Can Run 13:18 Next Year Fernandez ran 4:00 with no speed work faster than 30 second 200s. His coach is a big fan of Jack Daniels. Alan Culpepper Calls Denver Half Marathon a "Hard Workout"
Culpepper Profile: "I have it all planned out"
The distance races were stacked at Pre. Maria Mutola got her 16th and final Pre win (assuming she does retire), Bernard Lagat looked great like he has every time in 2008, Abdi Abdirahman just missed Meb Keflezighi's American record at 10k, and Alan Webb made his 2008 track debut and ran like we've never seen him run before. High schooler Chanelle Price ran 2:01 in the 800 and high schooler Jeff Demps was third in the 100. On the boards: Biggest Disappointment at Pre? We actually really agree with the first poster. Asafa Powell Has No Comment on Gatlin's Drug Woes: "Justin is not the big thing anymore"
LRC Rankings: Men's and Women's 5k Lagat and Rhines #1. LRC US Steeple Rankings Last week we uveiled our US distance rankings at 800 and 1500. We'll update those tomorrow and give our 5k rankings as well. But here today are our men's and women's steeple rankings. Drug Talk: Hopefully Bolt can join some sort of baseline testing program like Tyson Gay to restore people's confidence. Om the boards Please, Jesus, Let Bolt Be Clean We think he should voluntarily join a baseline testing program like Tyson Gay. And while we're at it we think that everyone's baselines should be published. 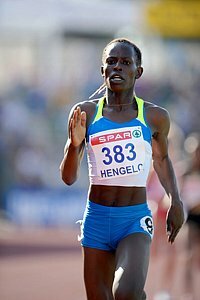 Hengelo: Pamela Jelimo 1:55.76, Geb Sub 27, Bekele Sub 13 It was expected to be an Ethiopian night in Hengelo, but 19 year old Pamela Jelimo emerged on the world scene in a big, big way with a stunning 1:55.76 800. Sileshi Sihine outkicked Haile G for the win in the 10k, and Kenenisa Bekele went sub 13 in the windy conditions. American Matt Tegenkamp ran 13:28. *Irving Saladino Jumps Farther Than Anyone Else Has In the Last 14 Years Shows how week the long jump has been that 6 men have still jumped farther. Great Interview: Jos Hermens Talks About Saladino, Haile Gebrselassie He says Geb did NO speed work shorter than 2000m prior to the race. On the boards: Jelimo's 1:55.76 possibly the fastest clean mark ever? *Victor Sailor Photos link fixed. Photos rearragned. A few captions added. LetsRun.com Ryan Hall Reflects On his Incredible Run We tell you (and let you watch) what Ryan, his dad, his grand-dad, his coach and even Martin Lel had to say about Ryan. Lel was full of praise for the American and shocked by Ryan's attempt to get the pacemakers to go even faster. If Hall didn't already have your respect, he does after reading this article as he pays homage to a throwback type of guy - Steve Jones. Text and Video. NCAA Day 3 Recap, Photos, Interviews Friday had great action at the NCAA track and field champs. It was a banner day for LSU and Trinidad in the Sprints, Jenny Barringer just missed the American record in the steeple, Sally Kipyego set an NCAA meet record itn eh 5k, Bobby Curtis went 3 flat the last 1200 to win the 5k, and Kyle Alcorn got his 2nd NCAA win. Not to mention Walter Dix is the ultimate team player and some major pros to Angela Bizzarri for a thirty second pr. *AP Recap of Friday's NCAA Meet Trinidad and LSU shine. More: Interviews: Kipyego, Berringer, Alcorn, Curtis, Vaughn, Nelson, Thompson, Dix, Hanany. Koll put on an exhibition in the women's 10,000m that got her a standing ovation before the homestate crowd. Shadrack Songok won an exciting men's 10k over Shawn Forrest as 9 guys were in contention with 3 laps to go. Ngonidzashe Makusha long jumped 27' 2.5", Brittney Reese long jumped a world leader, and Ashton Eaton went over 8000 points in the decathlon. Plus Manzano, Wheating vs Hernandez round 1, Felnagle, and falls and controversy in the men's 1500 semi. Alysia Johnson pulled out of the women's 800 with a sore foot as a precautionary measure for the Olympic Trials. *IAAF Recap of Day 2 of NCCAs Focuses on LJ's Brittany Reese seemed disappointed with her world leading win as she was hoping to go 23' feet but says injuries have hurt her. Meanwhile, FSU freshman Ngonidzashe Makusa was obviously thrilled with his 27'2.75" performance that made him the #4 guy in the world and gave him an win by almost a foot. Day 1 was 100% prelims and by and large most things went according to plan (Porscha Lucas the #1 seed in the 200 didn't make the 100 final for Texas A&M). Travis Padgett looked like the man to beat in the 100m semis. Jacob Hernandez and Andrew Wheating both advanced to the 800 semis easily, and the great NCAA career of Yale's Lindsay Donaldson came to an end. Mark Wetmore's CU team got 2 steeple prelim wins, and 3 guys into the 5k final. *Track and Field News: NCAA Men's Predictions 10 deep men's and women's individual predictions. *Billy Nelson Ready To Make Some Noise At NCAAs He took up the steeplechase as a 5'5 college freshman and has only grown one inch since. A Brief Chat With Abdi Abdirahman - He doesn't call himself it but we will - the favorite for the 10k at the Trials after his 27:16 10k at Pre. Abdi talks about how he was headed to Hengelo until he lost his passport. Angelo Taylor On Comeback Trail From individual Olympic Gold in 2000 to no contract and working as an electrician just a few years ago, the American is now shooting for gold in both the 400 and 400 hurdles. Andrew Baddeley Will Run 3k - Tom Lancashire 1,500 At European Cup Team Competition It will be Lancashire's 1st time in a British vest as a senior. Steve Cram Full of Praise for Andrew Baddeley If you weren't impressed with Baddeley's 3:49 Oslo mile win, then you will be once you learn he's an aerospace engineer from Cambridge. A Look at Chicago's Olympic Bid If McCain wins, the bid may be in trouble because he was against the IOC Salt Lake Corruption. *Gatlin says his running career isn't over. LRC Robert Cheruiyot Destroys Field And Joins Bill Rodgers As a 4-Time Winner After a slow opening two miles, Robert Cheruiyot put on quite a show as he wheeled off 17 straight miles at 4:53 or better including a 4:36 19th mile that mile that fnished his only reamining challenger, Abderrahime Bouramdane. His performance in the middle miles was incredible. Recap, photos, post-race comments. *Former Drake Runner and Current Med Student Ashley Anklam Is Firs American Female Finisher in 2:48. He had high praise for the Boston crowds: "Boston was a pleasant surprise. I expected the crowds to be great but they were about ten times what I expected"
*AP Article on Lance's Run Lance talks about the Boston hills. LetsRun.com Boston 08 LetsRun.com Party Photos The party hosted by Puma was a smashing success. A packed house as those passionate about running (from ages 5 to 65+) came to celebrate a great weekend in Boston. LetsRun.com fans celebrated with Rojo, Wejo, Matt Taylor, and a few legends in the sport, including former marathon world record holder Steve Jones and Olympic Silver Medallist Sonia O'Sullivan. The Harpoon beer was flowing, DJ Inkognito kept things going and contrary to popular opinion there was a healthy mix of males and females. The reviews were excellent. "It's refreshing not to see the same 50 people (industry insiders) at a party." "Most favorable female to male ration I've seen in a long time." Maurice Greene Defends Himself He says he never used drugs but did pay for teammates bills without asking what it was for. Greene: "This is a bad situation for me. My name's come up in something and it's not true." Other London Coverage: *Yelling Makes GB Team: A great moment when she looked rival Hayley Haining in the eye at 19 miles,. Amazingly both ended up happy as both PRd. *Jon Brown Blasts UK Performance Director Dave Collins The 4th placer in the marathon at the last two Olympics absolutely rips Collins - a man who somehow managed not to show up at world cross country last month when it was in Scotland..
101 Years Old, Still Smoking, Running, and Drinking: Buster Martin: "I'm not worried about the fags because I'll carry them with me. Everyone says smoking kills but it's taking a long time in my case" The 101 year old legend plans on smoking while running Sunday's London Marathon. USOC Gives USATF 2 Weeks to Submit a Reorganization Plan or Face Decertification All the boards members are getting in the way.